How many people actually like this time of year. Despite my birthday falling in this month I always end up with what I like to call the January blues. Trying to get back into a routine after Christmas seems so much harder than any other holiday, I think more because of how dark it is in the mornings and the general bad weather that goes with it. This week has been somewhat of a struggle for me. Kids are back at school, which means I too am back to work, back to volunteering and on top of that, this month I really need to finish off my last assignment for my teaching assistant course otherwise I'll have to pay for an extension which I definitely don't want to do. But despite the deadline I'm finding it difficult to get motivated. One thing that I've done though, I have managed to come up with another #LittleLoves post for you to peruse at your leisure. I think it will come as no surprise after beginning this post that the majority of my reading matter has been textbooks and reading through my own work to edit my answers in a bid to get them correct. I've always been rather academic so the silly thing is, once I actually get going I can get a lot of work done in one time but at the moment I'm easily distracted by social media. Scrolling through Twitter has not helped me this week. In the midst of coursework I've set myself a mini goal of reading one book a week. 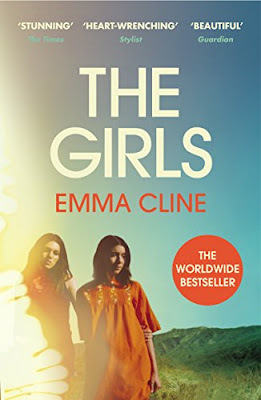 One novel I've been wanting to read for a while is The Girls by Emma Cline, this was after reading someone's review last year after linking up with my Read With Me linky. This is a great thriller, one that really manages to pull you into the pages, it will definitely get you excited about reading if you're having a hard time finding your reading mojo. Ok I'm not going to lie. I've watched a few minutes (plus hours) of celebrity big brother. It's one of those programmes that is great to have on when you don't really want to concentrate on something isn't it, what I like to call good old fashion trashy TV. I found it slightly dry in the beginning but of course the dynamics changed with the males being added although I couldn't pick out a favourite housemate at the moment. Something else I watched that technically was last week but I forgot to mention, the new Jumanji movie. I took my girls to see it at the cinema as a last treat in the holidays. Now I loved the original and if I'm honest was expecting for this one to not be as good, I was wrong. It is highly entertaining and apart from a couple of more sexual references that went right over my five year old's head, I'd say it is a perfect family movie. Fast paced and funny there is something in it for everyone to like, the cast is fantastic! The bloody alarm. It is one of those sounds that I am never going to grow to love. Has anyone managed to find an alarm tone that doesn't either wake them with an almighty jump or just go right through them? Mine goes off at 5.50am Monday to Friday and there are times where I hit the snooze button and then instantly regret that decision when the alarm tone starts up again ten minutes later. I'm always on count down for the weekend when I wake myself up naturally instead. I've talked previously about my sleep problems. I'm my own worst enemy as it takes me a long time to fall asleep and because I get up so early in the morning I average around 5 hours sleep on a normal night. In a bid to go to sleep at a more reasonable hour I gave in and purchased some of Lush's sleepy lotion as I'd seen so many recommendations for both children and adults. As well as the lotion I have been spraying my pillow with a mist that contains things like lavender as it's these scents that are somehow meant to relax you. I'm not going to lie, as much as didn't mind the smells, and as much as I was desperate for this to work, it isn't full proof. I have had a few nights where I've fallen asleep, not instantly, but quicker than normal however there have been the other nights when I'm still lying there listening to the husband snoring. Since starting up exercising again last week it has been all about breakfast time for me. That's because after a workout is when I like to eat my intake of carbs. And one thing that I absolutely adore is bread, especially when topped with peanut butter and banana. I add a few chia seeds for extra protein too. I know what you're thinking, I really know how to treat myself. If I'm not eating this then I opt for a good protein porridge. There's something great about eating a nice warm breakfast this time of year. Compared to a few years ago when I would always skip breakfast, nowadays I'm telling everyone that it is indeed the most important meal of the day. As much I have the January blues I've managed to keep up my healthy eating habits and exercise since the start of the month, that's right, twelve whole days!! This week I stepped up my workouts by buying myself a barbell. It comes with weights to make it up to 20KG (something I need to work my way up to) so I'm definitely working on the slogan strong not skinny this year. I think you would have been highly entertained watching me attempt to lift the full 20KG especially when a moment later my husband lifted it up in the air with one hand. At least I have something to aim for right?! Of course I'm linking this up with Coffee Work Sleep Repeat's Little Loves linky so do go and check out some of the other posts linked up. that book sounds fab I will definitely have to check it out. January is such a tough month isn't it? Well done for sticking with the healthy habits and exercise, you're doing much better than I am.